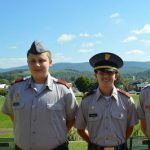 Cadet Justin Tomayer was named Fishburne Military School’s Cadet of the Month, Cadet Donald Cravins III was named Fishburne Military School’s Cadet Officer of the Month, and Cadet Myles Hurlbut was named Non-Commissioned Officer of the Month. Charlie company earned Company of the Month honors. 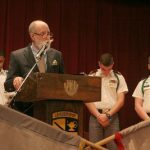 The announcement was made before the entire assembled Corps.